A while back, I updated my “faves” page to reflect all of the ultimate repurchases I’ve curated over my five years of blogging. You’ll notice that the “acne treatments” section is the largest of the bunch, and I cannot tell you how ecstatic that makes me. 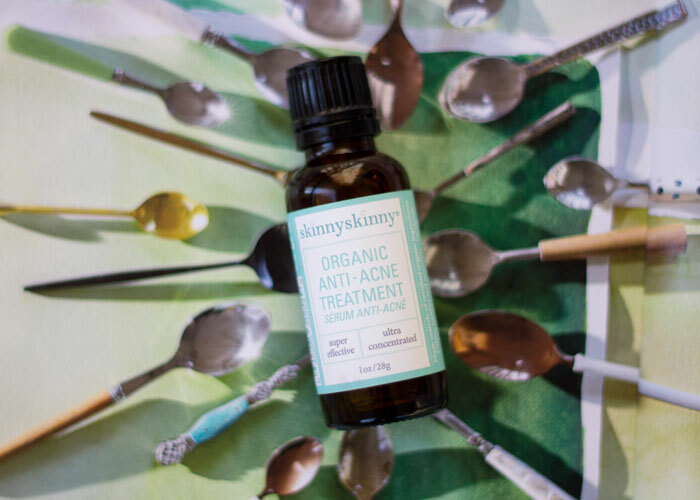 I’ve finally found some wonderful, effective, natural products that truly work at gently treating and preventing breakouts, and I’m thrilled to detail one of my latest additions to the repurchase list here: skinnyskinny’s Organic Anti-Acne Treatment. During a recent facial at my beloved local spa, my friend and aesthetician Kristin applied skinnyskinny’s Organic Anti-Acne Treatment onto my skin, and I immediately had that same comforting “ahhhhh” sensation that I felt when I first used another favorite acne treatment on my skin. That’s basically how I measure up every single acne treatment. Seriously. Does my skin have some sort of crave / response to it? It must be working. Scientific, I know. In all seriousness, though, the cooling and calming effect it had on my skin and senses was noticeable. The familiar scents of old favorites tea tree and lavender combine with antiseptic niaouli oil (a new one to me!) and anti-inflammatory thyme oil for a simply powerful acne-killing blend — all in a base of antibacterial, antioxidant-rich babassu oil. That makes skinnyskinny’s Organic Anti-Acne Treatment appropriate to spread all over the skin as a preventative treatment as well as for use as a spot treatment. I go both routes, dabbing it onto spots and, when I’m feeling congested or know that zits are in my future (ahem, mother nature), spread a thin layer onto my skin after moisturizing with a simple carrier oil like marula, argan or jojoba. As mentioned in the intro to this post, this is just one of many acne treatment faves. I’ve written an in-depth review of another one that I absolutely love (and know you do, too! ), but consider both of these must-haves for very different reasons. skinnyskinny can be used all over the face because of the babassu oil dilution. It’s also packaged in a larger bottle, but it’s not a roll-on; if you spot-treat, you’re likely going to be using a cotton swab. skinnyskinny is also substantially less expensive, as you get more product, so you don’t feel guilty about using it all over your face (and it’s intended to be used that way!). Is it just as effective as this one? Yes, though I will say that it takes a bit longer for it to treat breakouts, but it is quite gentle and can be used more in the preventative process. The former is better for those “OMG please get rid of this volcano on my face” times we have — and it indeed zaps them quickly. My beloved, holy grail acne treatment that I’ve pretty much never quit talking about since it gave me stellar results in 2012 is different from both of these in that it’s more for those painful cysts that crumble your soul. Spot treatments and serums just don’t do the same for me, so that’s why I’m adamant at having all three of these in an acne-prevention arsenal. Prevention, pimple-killing and cyst-zapping all require different slayers! So with that, I absolutely stand by the addition of skinnyskinny’s Organic Anti-Acne Treatment onto my “faves” page and repurchase list. I’m impressed with the concentrated yet calming and, of course, effectiveness of this product to prevent and gently treat breakouts. What natural acne prevention products are in your arsenal? What different types of breakouts do you battle? What’s on your ultimate acne treatment repurchase list? Tell me in the comments section!